In January 2012, I did a 21 day whole food cleanse (related posts) which was created by Whole Living Magazine. Basically the first week was fruits, vegetables, nuts and seeds. The second week, we added in some gluten free grains, and the third week we added lean protein (eggs, fish, chicken breast). This year, I have also decided to go on a whole foods cleanse, but really it's more of an elimination diet. I've made some personal modifications to the cleanse from last year and today I am Day 6 into it, feeling happy to be over the initial hump. Right before the holidays I had met my tolerance for the girls' art supplies. While I completely adore all of their cut, colored, and glued creations, I couldn't take another day of finding art supplies scattered on every available surface not to mention errant marker caps under the table. Of course inevitably there was also the constant search for a glue stick or scissors. Mom, have you seen my mechanical pencil? Finally, I came up with a solution to share! In the past my initial reaction would be to run out shopping to find "just the perfect" bins to organize their supplies, but not this time. I simply walked into my organized storage closet and found a basket to house all of the supplies that I thought would be a manageable size for both the girls to handle. 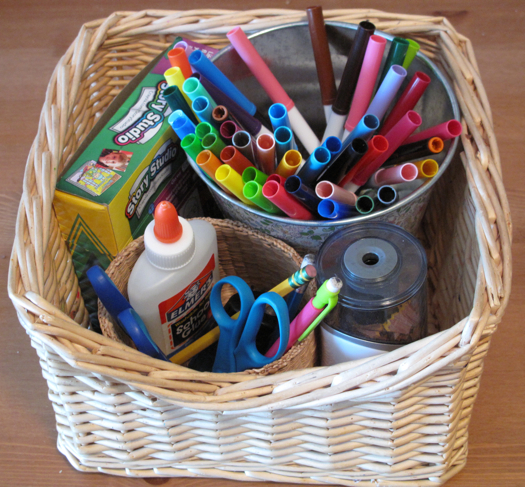 Next I eyed a couple of smaller bins to store the markers, erasers, glue, pencils, and scissors. On this glorious sunshine filled summer day, I am riding my bicycle with a yoga mat peaking out of the top of a wicker basket that's attached to my handlebars. My body has a warm sun kissed glow, my lips are glossy red, I'm wearing obscenely short Lululemon speed shorts that accentuate the legs that push me to 5'11". There's no chance I'd hide these thighs after the work I've done to earn them. My hair is gently blowing from underneath my helmet because even though this is a fantasy, I never forget the small details such as safety. My left arm rises making a 90 degree angle, signaling to the cars whizzing by me that I am taking a right hand turn. My femininely toned bicep catches my eye. My torso isn't hidden under a baggy tank top because I lost my muffin top one emotionally charged lifetime ago. Now that I look a little closer, I recognize this is where I am suppose to be in my skin. I applaud the first day of January. There's just something about the reset of the calendar that gives me a nudge to try again. My motivation strengthens beyond compare and all of my fraught ridden attempts from the year that has passed, slips into the fleeting memory compartment of my brain.